Help pass HB 204. It’s a common sense bill to prevent teen car crashes and help police officers do their job effectively. Safe Kids Worldwide strongly believes that this bill will promote safe teen driving and ultimately save lives. Good drivers need experience which is why graduated drivers’ licenses work to save lives. HB 204 would extend the nighttime driving restriction and limit the number of teens a teen driver can have in the car. Why is this so important? 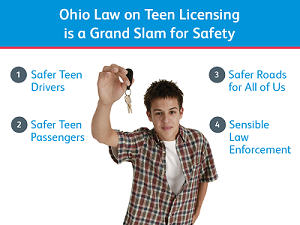 In 2010, more than 5,000 people died in crashes involving teen drivers in the U.S.
A 2013 statewide survey concluded that over 90% of Ohio parents surveyed support the new driving restrictions. Because present law is so complicated, it handcuffs police from enforcing the law effectively. Get a full rundown of the bill. Ohio’s House Transportation, Public Safety and Homeland Security Committee passed HB 204 on February 11th and it is now ready to be voted on the House floor by all 99 members. Let your legislators know that you want them to support HB 204. Take action. It’s easy. It takes about as much time as buckling up. Thanks to our allies at the National Safety Council and for your commitment to protecting kids in your community!